“Are you a vegetarian or non-vegetarian?” asked the waiter at the hotel to my South Indian colleague Swami. This question always confuses him. “I am a vegetarian mostly, but I can eat chicken, except on Tuesday and Friday. So it depends on what everyone else is ordering”, he replied. Such responses always confuse waiters in hotels, who have a simple way of classifying people. According to them, there are two types of people in the world – vegetarian and non-vegetarian. Alas if only it was so simple – my South Indian colleague Swami being a case in point. “There are two kinds of people in the world, those with loaded guns, and those who dig. 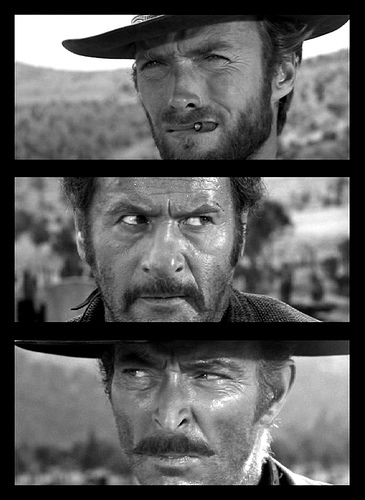 You dig.” Clint Eastwood made this dialogue immortal in the movie “The Good, The Bad and The Ugly”. It seems to me that there are two types of people in the country, or maybe the cricketing world, at least for now. Those who think that MS Dhoni was right in calling Ian Bell back (in the Trent Bridge test), and those who feel he was stupid to show such generosity on the English team. Among those who think he was right, again there are two groups – those who think he was a true statesman of the game, doing it to uphold the spirit of the game; and those who think he was just a pragmatist, and hence did it to ensure that the Indian cricket team’s brand value (and hence the money they earn) does not go down. And then there are those type of people (mostly media commentators!) who change their views according to the situation. Those who initially started justifying the morals of how Dhoni was right in appealing for the run out, and how the spirit of the game itself has changed in today’s world of cut-throat professional cricket; and later changed to applauding Dhoni for his generous act on realising that Ian Bell was walking out to bat again. There are some other ‘two types of people’ in the world today too. Those that think Breivik, the person who fired at and killed 70 odd people in Norway, was an example of emerging, right-wing, ethnic extremism in Europe, and those who think it was not that – that it was just the delirium of a madman. Among those who feel he was an extremist, again there are two groups – those who are shocked by the scale and brutality of the murders irrespective of who did it, and those who are shocked because the killer was not an Islamic terrorist, but a Christian Westerner who hated the tolerance of multiculturalism. And then, there are those type of people (mostly Western politicians!) who change their views according to the situation. Those who started condemning the killing as another example of ‘acts of terror’, and then called it a madman’s act after realising that the killer was not an Islamic terrorist. There are two types of people in the markets too. Those who think long-term fundamentals-driven investing is the right way of making money in the markets, and those who think there is nothing like long-term, as all of us are dead in the long-term – so short-term technicals-driven trading is the way to go. Those who invest for wealth creation, and those who trade for income generation. And then there are those type of people (mostly Brokers and people on business channels!) who change their views according to the situation. Those who say investing is the way initially, and then, when the markets go up tell us to become traders. Or those who tell us to make money as traders initially, and then, when the markets go down, ask us to become long-term investors. So it seems the world is made up of two types of people with two sets of clear but divergent views. And then, there is a third type who change their views depending on what suits them; but who somehow seem to matter and drive their worlds. And finally, there is a fourth category. That is the type of people who have no view as such, perhaps the majority, depending on the arguments between the first three types to form an opinion. If you are neutral and have no view, your individual view probably does not matter much, and is there for the taking to be influenced. You are probably the common man with no voice, and in the markets, you are probably the retail guy with no choice. Like my South Indian colleague Swami, you are dead meat even before placing the order! I think it is one of the best . Swami sounds real. I think you have got the right mix of humor, content and message. keep at it. I am definitely your fan.